This oil on canvas painting is done by Donald "Rusty" Rust. The black background, in contrast to the image of the girl makes this painting come alive. The texture of her towel and the carpet make this one of the most appealing Rusty Rust paintings that we have seen. By moving the cursor over this image, you will be able to see a closeup view. Donald "Rusty" Rust was born in Erie, Pennsylvania in 1932. He had an interest in drawing and painting at an early age and never had a desire to be anything other than a serious painter. 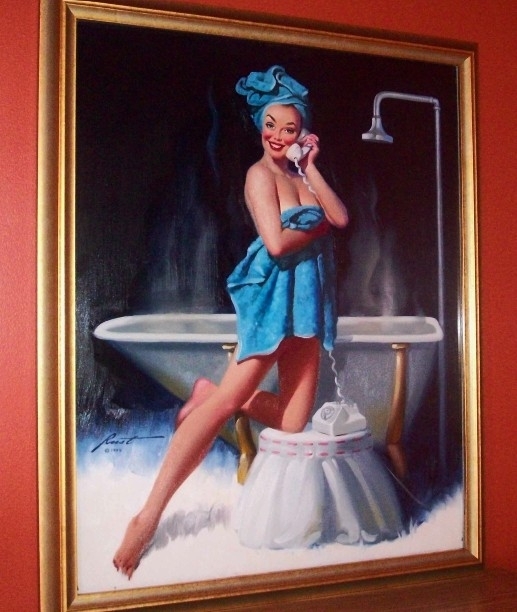 His early work was directly influenced by his grandfather, Emil Rust, Gil Elvgren, Norman Rockwell, and Bob Toombs. He is known for glamour and pin up art, illustrations, wildlife, scenics, camoflauge and illusion paintings, landscapes, seascapes and portraits, along with several circus image paintings. His paintings are displayed at the Norman Rockwell Museum in Philadelphia, Pennsylvania and the National Portrait Gallery of the Smithsonian Institution in Washington, D.C., as well as the Ringling Museum of the Circus in Sarasota, Florida. Among the prominent people Rust has painted are the famous clown Emmett Kelly, Sr., Ringling clown Lou Jacobs, Mamie Van Doren, and Norman and Molly Rocklwell. He also did extensive work in book illustration, doing commissions for Reader's Digest, Wildlife Art News and Windsor Publications. Most of Rusty Rust's works are oil on canvas, and his artwork can be seen on calendars as well as on jigsaw puzzles, mugs, collector plates, and trading cards. Mr. Rust currently resides in Florida.